This immaculate three bedroom, two bathroom Princeville home located on an extra large, elevated corner lot in Princeville. Beautiful laminate flooring throughout. The master bedroom/bathroom suite is located at one end of the house and the second bathroom and additional two bedrooms are located at the other end of the house. Cathedral ceilings in the great room expand the living, dining and kitchen area. Upgraded kitchen appliances, fans and window coverings. Enjoy the added bonus of outdoors with over 290 square feet of patio/lanai. This home is in excellent condition, reflecting care and attention to detail. Cooling trade winds flow through the bright, spacious interior. Large double car garage. Furnishings are included. A new roof was added in the spring of 2007. 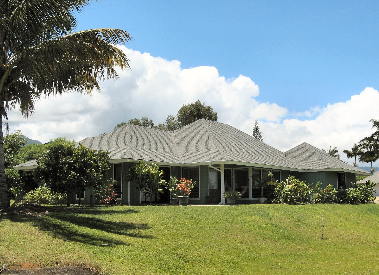 Enjoy living in Princeville, Kauai with fabulous golfing, swimming, surfing and hiking nearby. Princeville Shopping Center is just a few minutes.